Giovanna Caramori, currently a senior at Bonny Eagle, is an exchange student from the Brazilian city of Indaiatuba, located near São Paulo. A member of the girl’s volleyball team, she speaks both English and Portuguese, and will be studying in the United States for the remainder of the school year. In addition to attending school in Maine, she has also visited Miami, Florida, and Disney World in Orlando. Her favorite subjects include art and biology, as her teachers are “very nice and friendly.” However, she observes that the Bonny Eagle education experience differs both in difficulty as well as in classroom activity. Some students at Bonny Eagle do not even know that Laura Palma is a foreign exchange student because she only has a slight accent! However, she is from Tremelo, Belgium. Tremelo is located in the Northern part of Belgium which is also considered to be the Dutch part. It is not very far from the capital city of Brussels. She was born in Belgium but came to the United States when she was about three months old because her father was stationed in Dayton, Ohio. Both of her parents are in the military. Laura and her family moved back to Belgium when she was five. Her few years here in the United States, however, allowed her to learn English. Laura loves the changing of the leaves and the colors it brings. She also says she loves how much nature there is in Maine. She hopes to come back to the United States to visit her host family and to see as much of the country as she can. According to Laura, school in Belgium is completely different. There is no eating in class, no using cellphones, and no listening to music. Also, the structure of the school day is very different. Belgium students do not have the same courses every day and there are seven blocks a day. A school day starts at 8:30 a.m. and is not over until 3:45 p.m. Students don’t get to choose their courses like we do here. Instead, they choose one or two majors and take other courses assigned to them. Laura is only here until the end of January, but she is ecstatic that she got this opportunity and plans to make the most of it! Nuttamin Boonma (Jom), a sophomore here at Bonny Eagle, is from Thailand. Jom came to the United States in August, and is loving what Maine has to offer. Her favorite things about Maine are the beautiful lighthouses outlooking the ocean and, of course, the Maine Mall. Her favorite activities are water sports, no matter what country she’s in. Anna Pipova, a senior here at Bonny Eagle, is from a small village called Bobruvka in the Czech Republic. One of Anna’s favorite things about Maine is the autumn scenery and landscape. She also really enjoys the lobster here. This is Anna’s first time in the United States, but it’s a dream come true. In the future, she hopes to come back and travel across the entire U.S. Anna really appreciates the number of opportunities there are to play sports here, being a member of the field hockey team. In the winter, she likes to go skiing and snowboarding. She also enjoys watching movie series and listening to music. A passion of hers is traveling. She is loving Bonny Eagle so far and is excited for what her last year of high school has to offer. Maho Teramoto is from Shiga, a community just east of Kyoto, in Japan. At home, Maho either walked, rode the bus, or took a train everywhere. Needing a car to get anywhere has been an adjustment. However, she is enjoying her time in the United States and is hoping to improve her English this year. “I used to live in India and Thailand, but I went to a Japanese school, so I didn’t learn much English,” she explains. Maho has gone hiking and sight-seeing since she came here. Her favorite subject is math. At home she plays basketball, but here at BEHS she is planning on going out for the swim team. Majo misses home but also enjoys the chance to learn about other cultures. Only a sophomore, she is hoping she can take part in an exchange program in another country next year. 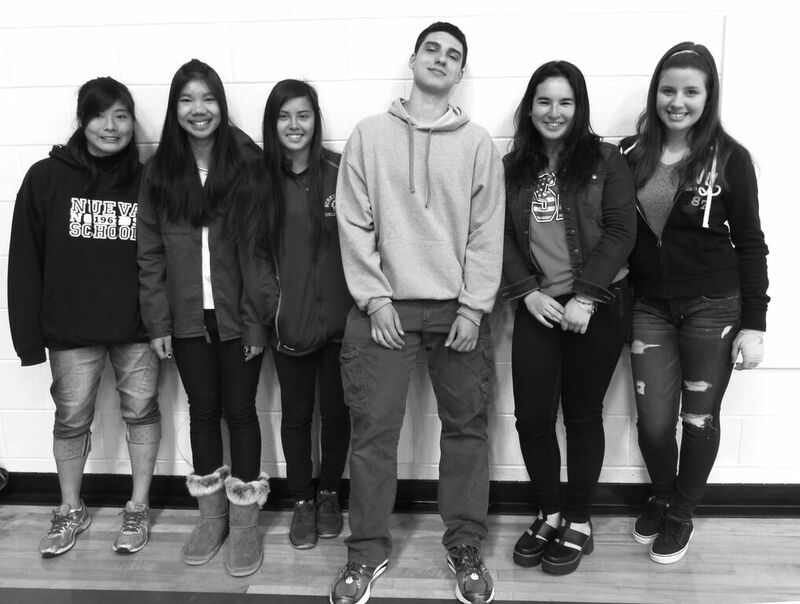 Six of the 10 foreign exchange students visiting Bonny Eagle this year get together for a group photo. From left to right: Maho Teramoto, Jom Boonma, Miranda Rey, Nick Milojkovich, Maria Ignacia Cunn, and Giovanna Caramori. At right, above, is Laura Palmer. Below right, is Anna Pipova. Missing from the photos are: Silvana Cabrera and Ross Yang. Being from the region of Asturias in Northern Spain, where lunch is usually around 4:00 a.m. and dinner can be as late as 11:00 p.m., exchange student Miranda Rey is having difficulty eating when we do. Miranda has also observed that we have foods from many different cultures here, as opposed to having our own traditional foods. Nevertheless, she is getting used to all these differences and is having a great time so far! So far Miranda has noticed that Maine is much more rural than where she is from. Also, the weather goes from one extreme to the other, unlike the usual warm weather in Spain. She thinks it’s unusual how we have malls and cinemas rather than town squares and churches. Miranda says school is also very different here at Bonny Eagle, primarily due to the fact that our school is much larger. There are so many students at BEHS that one student might not know another student, compared to how she knows everyone in her small town. School in itself is very different here as opposed to her school back home. She was surprised to see that students wear many different styles of clothing, that there are many big school events, that students learn many various subjects, and that the rules are less strict as opposed to her school back home. ​ Maria Ignacia Cunn, a junior here at Bonny Eagle, is from Southern Chile. This is her very first time in the United States. Maria describes Maine as “very different” and “relaxing,” compared to her country. Her favorite things about Maine are Dunkin Donuts and the high school football games on Friday nights, seeing her first one a couple of weeks ago. Her favorite activities are being a member of the cross country team, drama club, and chorus. She is very excited about spending the rest of her junior year as a Bonny Eagle Scot.